There has been debate about leakage of cooling air from parallel fan powered VAV terminal units. 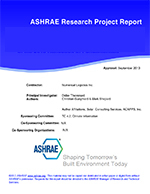 A qualitative set of observations were performed on a number of series and parallel fan powered terminal units located in two of the older buildings on the campus of Texas A&M University to provide quantitative data on this issue. The units were instrumented to record plenum temperatures near the unit, static pressure at the entrance and downstream of the unit, and the static pressure rise across the unit fan. 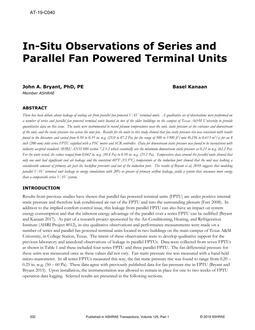 Results for the units in this study showed that fan static pressure rise was consistent with results found in the literature and varied from 0.10 to 0.35 in. w.g. (25.0 to 87.2 Pa) for the range of 500 to 1300 ft3/min (0.236 to 0.613 m3/s) for an 8 inch (200 mm) inlet series FPTU supplied with a PSC motor and SCR controller. Data for downstream static pressure was found to be inconsistent with industry accepted standard AHRI/ANSI 880 section 7.2.1.2 which essentially sets the minimum downstream static pressure as 0.25 in w.g. (62.2 Pa). For the units tested, the values ranged from 0.042 in. w.g. (10.4 Pa) to 0.10 in. w.g. (25.2 Pa). Temperature data around the parallel units showed that only one unit had significant cool air leakage and the consistent 60°F (15.5°C) temperature at the induction port showed that the unit was leaking a considerable amount of primary air past the backflow preventer and out of the induction port. The results of Bryant et al, 2010 suggests that modeling parallel VAV terminal unit leakage in energy simulations with 20% or greater of primary airflow leakage, yields a system that consumes more energy than a comparable series VAV system.